What draws us to particular spaces? What do we know about the space, and it’s geography, before and after we choose it? Who was here before us? Who is us? Where is us? What are we doing here? Where are we doing? And why. The spaces we choose to hold our events in are determined by a number of factors, but are those factors aligned with equitable intentions? The conversations this toolkit hopes to inspire is meant to convince you, to persuade you, to con you, into thinking deeply about the space your program occupies. Whether it’s a workshop, a classroom, a reading, an art exhibit, or a musical experience - we need spaces! Incorporating thoughtfulness and mindfulness will not only help to make our events more meaningful and engaging, but it also fosters inclusiveness that in the long run can build equity in our communities, through the pathway of artistic practice. A photographic journal/zine that seeks to embrace the non-linear reality of life's transitions. 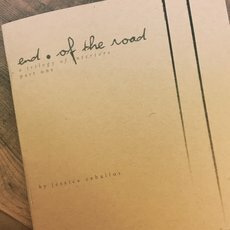 End of the Road was written on an iPhone, while in the car traveling from Los Angeles to Seattle in February of 2014, a time period Jessica now considers to be the beginning of her new life. Each passage was written as reponses to photos that were taken moments before, which were responses to songs she was listening to at the moment, which were suggestions from friends shared via Facebook, under the hashtag #endoftheroad. /all proceeds from sales will be donated to L.A. Tenants Union and/or other Tenants'-led Rights organizations currently working to help long-time Highland Park tenants avoid no-fault evictions. On November 9, 2016, The Rattling Wall and PEN Center USA put out a call for post-election poems, stories, and essays. People had six days to send their “protest, promise, rage, and wonder.” Work poured in from across the country. Not just from writers, but from teachers, doctors, activists, analysts, moms, dads, even school kids. We announced that, if we received enough work, we would immediately go into production on an anthology, a collection of voices. We would rise up. ONLY LIGHT CAN DO THAT is that anthology. ​Some of Los Angeles' most exciting poets use a collaborative process to create new works, including Jessica Ceballos, Chiwan Choi, Elena Karina Byrne, Sesshu Foster, Ramón Garcia, Douglas Kearney and Terry Wolverton. "This anthology features the vitality and variety of verse in the City of Angels, a city of poets. This is more about range then representation, voice more than volume. Los Angeles has close to 60 percent people of color, 225 languages spoken at home, and some of the richest and poorest persons in the country. With an expansive 502.7 square miles of city (and beyond, including the massive county of 4,752.32 square miles), the poetry draws on imagery, words, stories, and imaginations that are also vast, encompassing, a real "leaves of grass." "A compilation of 86 poets from throughout Southern California, including 7 Poets Laureate, 11 Pushcart Prize Nominees, and over 20 national literary award winners, all representing over 158 books authored by these poets. All the works in this superb collection were reviewed and selected by 8 published poets serving as a “peer review panel” with the editor, Poet Laureate Thelma T. Reyna. An outstanding contemporary book to add to your collection!"